I am often asked how to travel by air to a painting event. I'm not sure what it is about packing for a flight that seems so much more daunting than packing your car. Like most of us, you probably over pack when you travel? Here are some tips to help you get better at packing light. You will appreciate it even when you are driving to your local beach or mountain range. 1. Pack less than you need. You already know this one, yet still, you don't listen to yourself do you? Pack no more than 2 bags: One bag will hold most of your clothing and a small bag of paint. The other bag will hold most of your paint gear and a second small bag of paint. You may also pack an optional carry-on, just remember that now you have to be able to maneuver with 3 items. 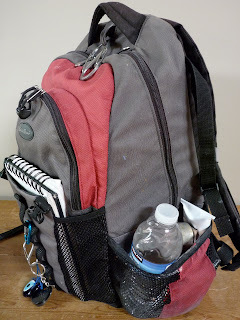 It helps if your carry-on tethers to your luggage easily or is a back-pack style. 2. Invest in a luggage scale. For $15 you can purchase a small luggage scale which could save you hundreds of hours of worry or hundreds of dollars. 3. Use your paint back pack as your carry-on. In addition to your make-up and jewels, items to be included in your carry on luggage (should you opt to have that added piece) are things that would be very difficult or expensive to replace such as your easel (needs to be a compact style for this. I will be posting soon on my latest equipment find); your brush roll with brushes (I like Grand Prix Super Brushes by Silver Brush be sure to remove palette knives), and 1 or 2 PanelPaks with clean panels (just enough to hold you over until they locate your checked luggage if it is stuck somewhere in transit). Small stack goes in my carry-on. Also pack business cards, event and travel contacts, schedule, maps, tickets, and other information in your carry on luggage for easy retrieval upon arrival. Pack your voltage converter for whatever country you are visiting, camera, charger, memory cards, and other expensive electronics like computers and iPads in your carry-on (or do without them for a week... even better). Remember to pack the luggage scale. You will need it when you return to weigh all of those wonderful souvenirs you bought. 4. Do not expand your luggage. Speaking of souvenirs, whether or not you are the typical souvenir-buying-tourist, likely you have experienced that things just don't fit right when you pack to come home. You always wish you had a little more room for some reason. If you flew to your destination without expanding the extra expando-zipper on your suitcase, you will be able to do that now and have plenty of room for your stuff to fit. Just don't forget to weigh it! In your checked luggage you will obviously need clothing (my list is shown below) and your remaining paint gear. PAINT: (I like to use Blue Ridge Oil Colors) Carefully wrap each tube of paint with bubble wrap and label the outside with the color name. Tubes often punch holes in other tubes if you do not do this. What mess when you squeeze really hard and all the paint comes out of a tiny hole into the palm of your hand. The length of travel determines how many tubes of paint I will need. For a week-long trip, I will pack 1-large tube of each color PLUS an additional tube of white AND 2-small tubes of each color. Then I place the tubes in thick zip-lock bags; the large tubes in one and the additional large white and small tubes in the other. ARTISTS' PIGMENT ENCLOSED.The US Department of Transportation defines "flammable liquids" as those with a flash point 140 degrees F or below. Artist grade oil colors are based on vegetable oil with a flash point at or above 450 degrees F. THEY ARE NOT HAZARDOUS. If you need to confirm this, please contact TSA at 866-289-9673 or their Hazardous Materials Research Center at 800-467-4922. To contact this traveler, dial (insert your phone number here). I used to always include the MSDS (Manufacturer's Safety Data Sheets) with the tubes, but have not done that in a long time. These can usually be found on the manufacturer's web site or on artist supply web sites. There's a copy of the full MSDS sheet on artist's oils on the Plein Air Liaison Social Network Blog here should you want it use it. I put one bag of paint in EACH piece of checked luggage. This is a safe-guard just in case one gets lost or confiscated, I will at least have enough to get me by a few days until I can purchase more. By the way, knock on wood, I have NEVER had a single tube of paint taken from me. If asked, never refer to your paints as paints. Refer to them as artists' pigments. PANELS: I like RayMar Art Feather Lite Panels 4 or 5 for each day x 7 days = 28 to 30 panels. Put half of your panels in one bag and the other half in the other. WET PANEL CARRIERS: (for carrying wet paintings) I have two PanelPaks (which you can purchase at www.panelpak.com) in each of the sizes I like to paint. These are thin and lightweight. Each PanelPak will accommodate 2, wet canvases that are the same size. Be sure to throw in some extra bands in case you lose or break one. When assembling PanelPaks with new, clean, panels, place the canvas side out. This will help you easily identify which ones have usable panels in them and which ones already have beautiful works of art safely tucked toward the inside. Collapsible cooler (makes great padding for potentially breakable toiletries) Use frozen bottles of water and have cold drinks and snacks all day. *DO NOT take mineral spirits on flights. You can get them at your destination. Your first stop, after your glass of (readers, insert favorite beverage name here), should be (in order of preference) a local art store, hobby shop, or home restoration store to purchase Odorless Mineral Spirits, White Spirits, or Turpentine and other mediums. I prefer Gamblin Gamsol. In a pinch, use the local olive oil instead of OMS. Just don't confuse which bottle is for your back pack and which is for your dinner! When you get to your destination, buy paper towels, baby wipes, sunscreen, bug spray, snacks, and water and save your grocery sacks for trash. 6. Ship your frames. If you're participating in a plein air festival, you will also be required to frame your work. Here are two possible options: 1.) Pack a small box of framing gear which includes hanging wire, strap hangers and screws, point driver, wire cutters, and screw driver. Have frames drop shipped to the location from your supplier. 2.) Pre-wire frames for horizontal hanging (you can always change them if you paint vertically). Ship frames, point driver, wire cutters, and screw driver to your location. Whatever method you choose, pack extra promotional materials (business cards, workshop brochures, copies of your bio, etc.) to have on hand or affix to the back of your painting.If I am teaching a workshop, I add Workshop Booklets, 1 per student,' to this list. 7. Pack 3-days' change of clothing and washing powder. Painting clothes (shorts, jeans, tees, layers) for 3 days. Check the weather reports for the region and pack accordingly. No matter what picture you have of a place in your mind, there is no reason to show up in Carmel in a bikini if it is only going to be 62º for the high. Dress clothes, jewelry, and nice shoes if needed (for opening receptions, networking dinners). Prescriptions and over-the-counter remedies such as Advil. Personal Hygeine: Lotion, make-up, deodorant, toothbrush and toothpaste, razor, hair products, and soap (assuming you are not staying in a luxury spa hotel that supplies these for you). Laundry detergent (dry or dissoluble sheet type) and Murphy's Oil Soap (for removing oil paint from clothing). paint on my palette and pack my back. I'm ready to paint at a moment's notice. You will probably question a few of the items I use (like the transparent tape and small zip-lock listed). I'll post more on that soon. I'm certain there are lots of other great ideas out there. This is just what works for me. It's become routine now. Hopefully it will help you too. Great post - very thorough and informative. Makes me want to take a trip with my paints! Great article- always learn so much from you! Thanks Lori!! Can't wait for the next article! Do it yourself blogs on anything and everything related to the work involved in living life as a plein air painter, including tips on social networking and marketing. With the help of our team:, Sergio Lopez, Lori Putnam and Linda Rosso. Coming soon, more informative articles by Carole Gray-Weihman and Alfredo Tofanelli. Head to our website to learn more. www.pleinairliaison.com.